Visual people find organizing to be more effective using different colours to represent different categories. Other people find having too many colours to be visual clutter and distracting. Colour can be used to motivate, grab your attention or calm your work space. My guest blogger Jessica Pyykkonen from Quill.com explains how to use colour to organize your workspace with this infographic. When the workspace becomes chaotic, color may offer a solution. Adapting a color-coded system will organize your office and make it easier to track and access information. Read about the psychological properties of colors, plus strategies to organize by color. Before applying a color-coded system to the office, learn the meaning behind popular colors to help dictate which hues to use and when. Red: Associated with energy and power, red is an intense color. Since it quickly grabs the eye, use it to alert coworkers of something urgent. Orange: Less aggressive than red, orange is still an eye-catching, dominating color. A hue closer to the shade of gold can mean luxury, wisdom, or wealth. Use it to label new or long-term projects that focus on the future or improving your business. Yellow: Also a great attention grabber, yellow signifies happiness, hope, and positivity and is commonly used for important items that cannot be ignored. Use for production tasks or to communicate new ideas. Green: A symbol of growth and fertility, green symbolizes stability and healing power. Use it for financial tasks and environmental initiatives. Blue: As a calming color, blue represents loyalty, intelligence, and focus. It’s also a trusting color. Use it for brainstorming, presenting, and networking. Purple: A combination of blue and red, purple is a creative color that symbolizes royalty and luxury. It’s great for creative tasks. Pink: A playful color, pink is full of compassion. It’s a loving, intimate, and feminine color. Save it for personal labels and special occasions. White: Associated with purity, white signifies success and perfection. Use it to signify simplicity and cleanliness. Black: A formal color, black can be prestigious or authoritative. Use it to make other colors stand out and for formal events. When it’s necessary to save every piece of paper that touches your desk, it can be easy to misplace important information in a pile of white. To file papers you may need to reference later, create a color-coded system with folders. Divide documents into categories—invoices, tax documents, office guidelines, etc.—and choose a color to represent each category. Use folders or tabs in each designated color to organize the categories. For file cabinets, choose an assortment of colored hanging folders, which are sturdy enough to hold most documents. When passing documents between teams, it’s a good idea to assign colors to departments or tasks. Colored file folders help distinguish which documents need to head to the HR department or be reviewed by the financial team. If using plain manila folders, stick colored labels or tabs on each folder. Multiple projects can be assigned a color and organized in three-ring binders. Maintain the color-coded system inside the binder to separate budget and creative documents. If it’s time to archive documents, use storage bins in the color-coded system to quickly identify what is inside. A calendar filled with back-to-back meetings can be overwhelming and ineffective. Ease the stress by assigning colors to events—both work and personal—to get a better understanding of your day-to-day activities. Visualizing the events can help control how much time you allocate to each activity or project. To categorize meetings, choose colors based on their psychological properties. Most calendar apps allow users to assign colors, but if you prefer traditional day planners, use sticky notes or colored pencils to categorize. Writing notes on paper is a great concept—until those notes get lost among other notes and are never read again. Take the color-coded calendar a step further by using the same colored pen to take notes. Color coding can also stimulate different parts of your brain and allow you to see connections previously overlooked. In a budget meeting? Use a green pen to jot down notes. If a creative idea comes to mind that you don’t want to forget to bring up during a weekly brainstorm, use purple. When you flip back through your note pages, the system will allow you to quickly find what you’re looking for. But avoid too much color—if everything is highlighted, it’s difficult to tell what takes priority. If hundreds of unread emails leave you overwhelmed, assign colors to senders or subjects to quickly identify what needs attention. Many email systems have settings to adjust how emails are displayed in your inbox. Assign automatic colors to specific people, such as your manager, so those emails will stand out. Messages can also be coded by subject line. If you’re working on a specific project, assigning that project name a color will separate it from everyday emails. Color coding is meant to make your work life easier. Assign colors before you start a new project and limit the amount to avoid confusion. You shouldn’t have to spend time deciphering your color code! How do you use colour coding to keep yourself organized? I am so thankful I come across this post! Reading the post makes me want to arrange my things by using color coding and see how it affects me! Thanks for sharing this. Colour coding works well for some people because at a glace you can find things more easily. 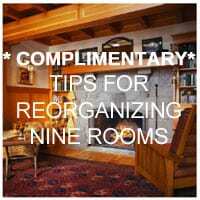 Let me know how the reorganizing works for you. If you need help I can work with you virtual to help you with the set-up. I once had an interview at a company that i’m applying for and the first thing that I noticed was their office was so dull. No color, its gloomy, and it comes with the sound of hands bashing on keyboards. It was an instant turn off. Before the employees, offices should follow the color schemes according to their desired environment. Great post! I really enjoyed your comment. I never thought of the use of colour as a way to help someone determine if they would like to work for that company. But it certainly does tell a little about the employer. Thanks for your comment. I agree with you. If you don’t like your office than you won’t work in it. Sometimes that leads to having work in many different places and things getting misplaced and left incomplete.